Bees and many other animals use what is known as optical flow to determine how fast they are going and how far they have moved through their environment. When ignoring all other senses, this means that they experience their surroundings as moving towards them while they themselves appear to be standing still. 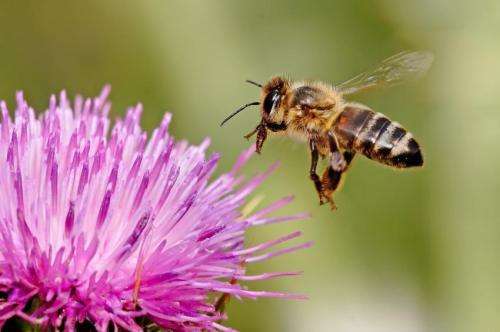 Until now, scientists have not known what actually happens in the brain of a bee when it finds its way back to the hive after flying around looking for food. The study, involving nocturnal rain forest bees, identifies which neurons in the brain allow the bee to measure speed and distance covered. It also identifies the neurons that use polarised light to determine the bee's compass direction. "We show how 'speed neurons' and 'direction neurons' work separately, but also how they likely cooperate to generate a memory that the bee uses to fly straight home after its nightly tours of the rain forest," explains Stanley Heinze, biologist at Lund University in Sweden. What bees and many other animals, including humans, can do is to integrate and collate all segments of their foraging trip to find the direct path home. This can be done without using landmarks and other details in the terrain, unlike what we intuitively refer to when thinking of our sense of direction. In a laboratory environment, the researchers placed electrodes into individual nerve cells in the bees' brains as they undertook virtual flights, simulating their experience of searching for food in the rain forest. The results, complemented by microscopic studies of the recorded nerve cells, were used in a computational model of the bee's brain. "We then built a robot and tested our model in reality. We sent it out on a random route and the model of the bee's navigation system that we implemented in the robot allowed it to find the direct path back to its starting point," says Stanley Heinze. That bees have this ability might even prove to be of existential significance for humanity, according to Stanley Heinze. "After all, we know that pesticides are detrimental to the bees' sense of direction, which means that fewer of them will be able to return to their hive after pollinating plants in our modern agricultural landscapes. Meanwhile, the majority of food production in the world is dependent on bees pollinating crop plants. Understanding the details of the bee's internal navigation system may therefore prove crucial when trying to design strategies to avoid disrupting them," says Stanley Heinze.